Besides parking your motorcycle under a school bus, the quickest way to make its age apparent is to let it sit outside in the elements. 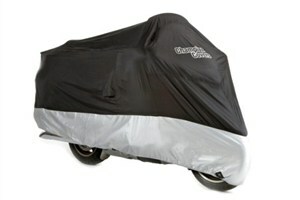 Just by taking the extra 2 minutes it takes to throw a cover over your bike will keep it looking young and fresh, but you do want to make sure you get one that fits correctly. If you're one of the many proud owners of the Yamaha V-Star Silverado, you might just want to consider a cover such as this one. It's specifically designed for the unique height and length of the Silverado and will fit with all of the accessories that you can throw on it. The cover has a couple of handy little features in itself, too, besides fitting correctly. It's made of high quality material and highly water resistant. Because it's lightweight and folds easily into a small package, it's easy to store in the bike. The cover is fleece lined around the windshield area and the fuel tank to keep it from getting any tiny scratches while putting it on or taking it off. It comes with a three-foot cable and lock so you can easily secure the cover to your Silverado. Because the manufacturer, Champion Covers, believes in the product so much, they offer a 2-year, no-hassle warranty. Anything happens, just ship it back to them.